I already typed at length about my compound butter, but in case you were curious... it was delicious there was none left over by the end of the day. My other contribution to a Thanksgiving meal made with friends was a large bowl of roasted sweet potatoes. No marshmallows, nothing fancy. I am a fan of simple roasted veggies with thoughtful seasoning. Here is my "recipe". I encourage you to adapt to your heart's content. place on large baking sheet. Roast for 30-40 minutes. stirring occasionally. 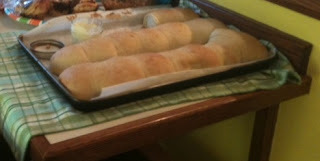 My Husband is the baker in our house... and he made delicious Parker House Rolls. I think we came home with two left over. They went very well with the garlic compound butter. A good and delicious time was had by all.